Aldermen: Thank You for Chipping Away at Aldermanic Courtesy! 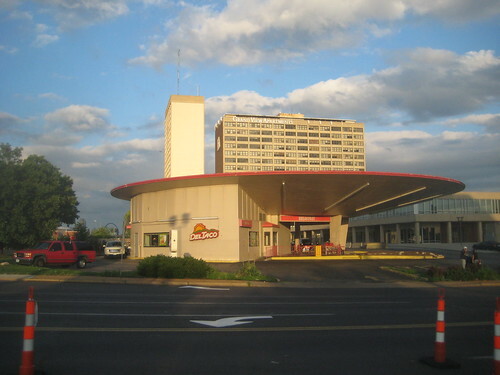 Although Board Bill 118, which authorizes redevelopment of the Flying Saucer (Del Taco) with demolition "necessary and desirable for the redevelopment of the Area under this Plan", was passed without any changes by the Housing, Urban Development & Zoning Committee by a vote of 5-2, the archaic concept of Aldermanic Courtesy was not the rule of the day. While other items on the meeting agenda were cleared by about 10:40, sometimes heated debate over BB 118 pushed the vote well into the early afternoon. Committee member Jennifer Florida asked several pointed questions about the bill and was of the two nay votes along with Committee Chair Fred Wessels. Lyda Krewson also had several strong questions about the bill, but unfortunately had to leave before the vote. 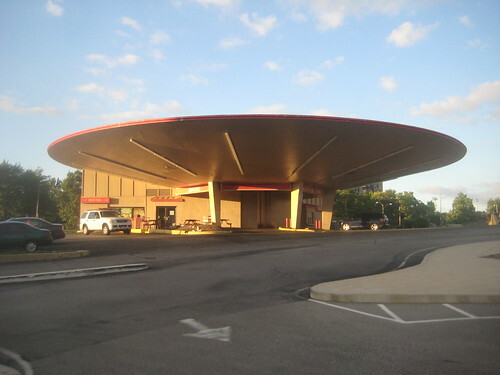 While not on the HUDZ Committee, Scott Ogilvie grilled developer Rick Yackey about his receiving Missouri and Federal Historic Tax Credits for his part in $60 million of rehabilitation and adaptive re-use for housing of the adjacent Council Plaza buildings, then seeking public funding for demolition of the Flying Saucer which is also part of the Council Plaza National Register Historic District. While the National Park Service, which oversees National Register districts unfortunately would allow this, Ogilvie made it quite clear that he believes it would be inherently wrong. Shane Cohn also raised some good points and went so far as saying that if demolition cannot be stopped, that he would like to see the building moved, and would be willing to help. Those of us that live in the City of St. Louis are not each residents of a village of 11,400 people, we are residents of an entire City and of a larger metropolitan region. Great leadership does not look inward and to be a great Alderman means always looking at the big picture of the entire City, understanding that things that happen from Carondelet to the tip of Baden affect us all. To the five of you who stood up, spoke out, made great arguments and asked the tough questions: THANK YOU!! When most of us think of "pedestrian friendly" retail, we think of great streetscapes with wide sidewalks, street trees and good urban buildings built up to or close to the property line along the back edge of the sidewalk. Thats great if you have a street lined with urban structures, but lets face it, Grand Boulevard in the vicinity of Forest Park Boulevard is never going to look like South Grand or the Loop. SLU missed their chance when they turned the expansion of Busch Hall inward to a food court. 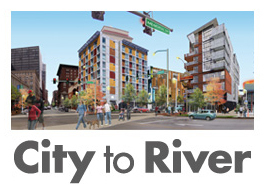 I don't see them building urban student villages along Grand in front of Reinert Hall, Marchetti Towers, Griesiedieck Hall or the giant Laclede Garage any time soon. With this in mind, tearing down the iconic Flying Saucer to build a single new 7,000 s.f. building built up to the sidewalk at Grand simply makes no sense. 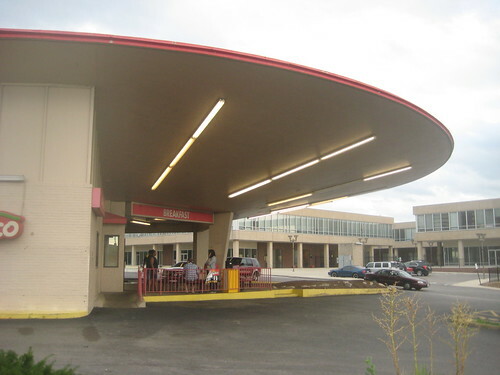 The Council Plaza complex was designed and built when the automobile was king. 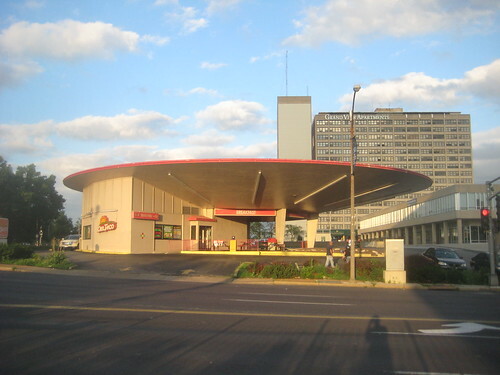 People who lived there, went to the union hall, medical offices and on-site restaurant generally arrived by car, and before there were tacos, they bought their gas or had the car repaired at the Flying Saucer. As with designs typical of the period (and now the norm in suburbia) the sprawling low slung former Teamsters Plaza building, which now houses the Flats at 374 is set back about 60 feet off Grand. While it would be possible to fill the gap by building on that 60 foot setback, unfortunately this would probably compromise the historic integrity of the building, and therefore the tax credits for the recent rehab. This might be possible after the five year recapture period though. 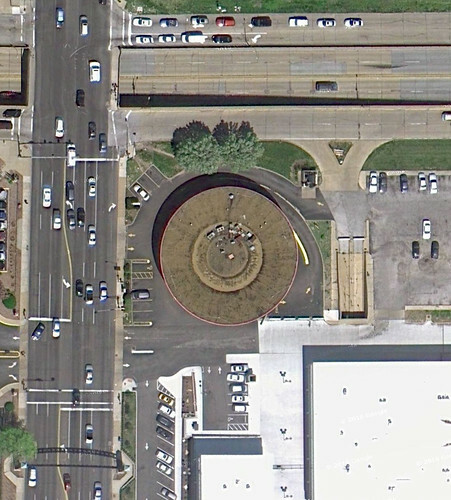 The problem with the Flying Saucer is not that it is set back off the street. The problem is that it is surrounded by asphalt, has a redundant driveway off Grand front and center, and is surrounded by a public realm that is anything but pedestrian friendly. So what can be done? 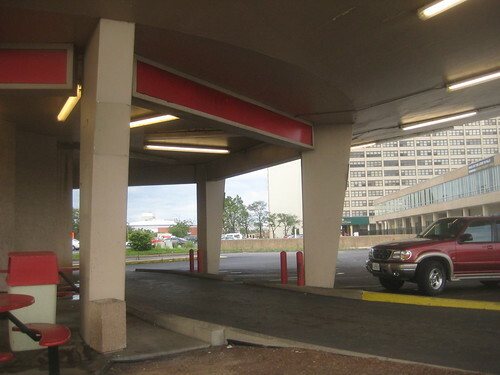 First, one would hope that the restaurants that are looking at the location do not have drive-thrus, which would allow the building to be freed from its asphalt collar, with placement of most of the parking at the rear of the site, shared with the adjacent residential buildings. Second, get rid of the front and center driveway off Grand. Next, add street parking on Grand. The right lane of Grand just north of Highway 40 strangely bumps out all the way to Forest Park with a width of about 19 feet, which could be split into an 8' parking lane and 11' traffic lane. 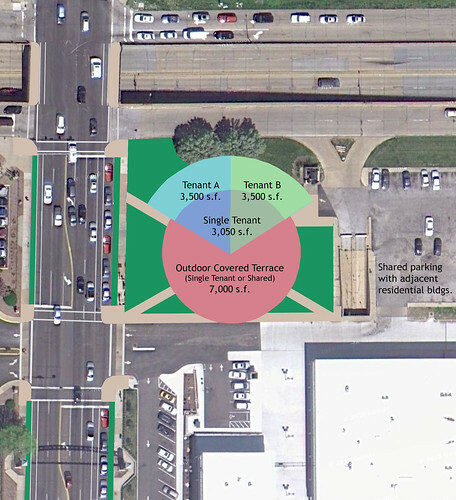 About 11 spaces could be added along the Council complex in two areas. Curb bulbs into the parking lane at the Council Plaza entrance and at the Forest Park corner would improve street crossings. While we are at it, the City could easily put Grand through this area on a road diet. 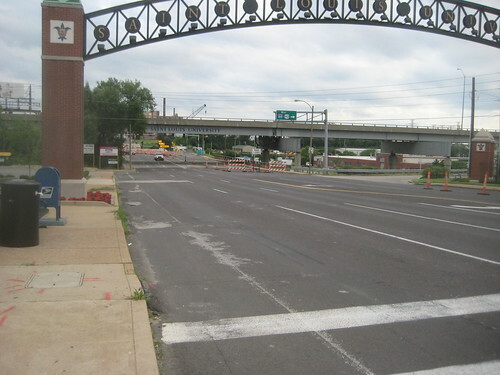 The new Grand Boulevard bridge over the railyard will only have 4 traffic lanes, and Grand reduces again to 4 lanes plus a center turn lane north of Lindell. It stands to reason then that the present 6 lanes plus a center turn lane could be reduced to 4 from the new bridge south of 40 all the way to Lindell. I would split the extra lanes to provide a dedicated bike lane on each side and add a tree lawn between the traffic lanes and the sidewalk, which are side by side along this entire stretch. Sidewalks next to the traffic lanes are desired in commercial districts, but in areas where street parking is not present, a tree lawn provides a buffer between traffic and people. Creating a better pedestrian and biking realm in this area would connect Grand Center to Metrolink, it would connect SLU's main and medical campuses and all of this would bring more potential customers to the Flying Saucer while reducing the amount of parking needed. Back to the building itself, the site & building plan above shows how the Flying Saucer could be just right for a 3,000+ s.f. tenant. As one friend on facebook suggested, maybe this could be a Starbucks, although I would prefer a Kaldi's. Removing the asphalt could open an expansive 7,000 s.f. outdoor covered terrace that could become the place to be seen in Midtown. The developer, Rick Yackey has talked about the possibility of two tenants. With a sensitive radial addition on the current drive-thru lane the building could be expanded to about 7,000 s.f. The height of this would want to be kept low, allowing the clearestory windows of the original building, which are now painted over, to be retained and re-opened. All of the service functions such as food prep, storage, restrooms etc. could go in the low addition, leaving the spacious sloped ceiling volume of the original building to be opened for seating. While some preservationists might cringe at the thought of alteration, I think it would be far better tan a wrecking ball. The bottom line is that Rick Yackey, Marlene Davis, and the rest of the Board of Alderman need to understand that there are many possibilities to preserve and re-use one of the most unique pieces of architecture that we have in St. Louis. The Flying Saucer, which was finished just a year after the Gateway Arch is a legacy from a time when people thought nothing was impossible. Remember that little thing about going to the moon? This is a time to throw out preconceptions, and it is also a time when YOU can act to show how this is possible. 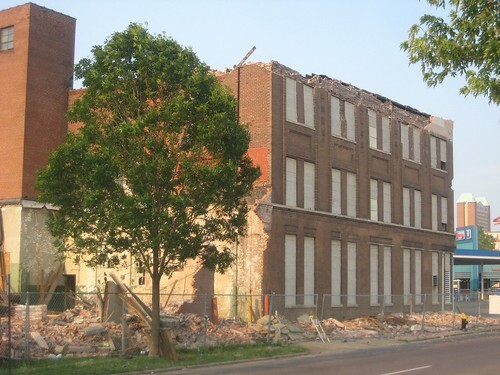 Tomorrow, Wednesday June 29th, the Housing, Urban Development and Zoning Committee of the Board of Alderman will hold a public hearing regarding the proposed demolition, which is part of Board Bill 118. The HUDZ Committee has the power to change or kill the bill. Please take time from your day to show up to City Hall, Room 208 at 10:00 am to voice your opposition. This may be the public's only chance to stop the demolition. 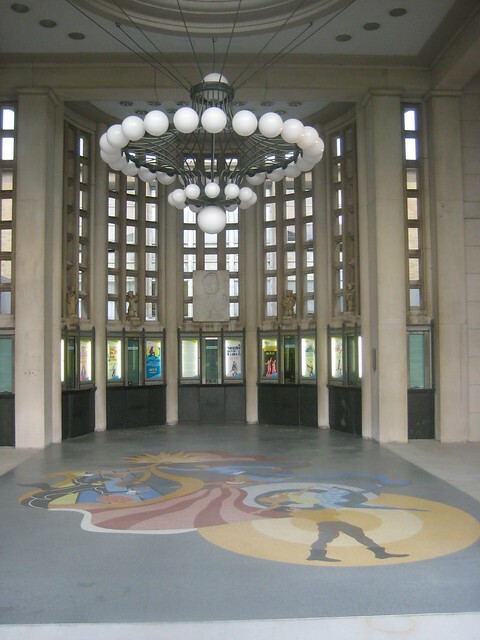 Tonight as the Muny opens its season of performances, theater goers will once again be graced by a beautiful work of art as they enter the the covered promenade. 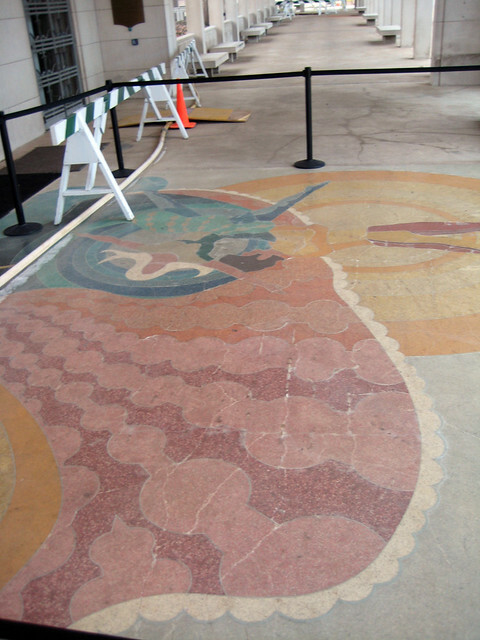 In early 2010 a water main break directly underneath the original 1971 terrazzo installation severely damaged the work and the concrete slab in which it was inlaid, with the lower half extensively cracked and slightly heaved. Sadly, it was determined that the terrazzo could not be saved and by Valentines Day the damaged artwork was unceremoniously pulled up new new concrete was poured. 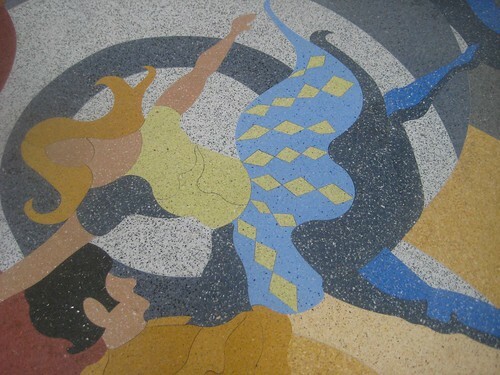 In May however it was announced that that the terrazzo artwork would be restored with a generous gift from the Marilyn Schnuck Charitable Trust. Some close-ups of the new terrazzo installation. The new terrazzo was laid last October, and the Muny's Facebook page has an album of photos showing the installation from start to finish. Unlike terrazzo installations of yesteryear, the new artwork was prefabricated in a shop, brought out to the site and assembled and glued down like a jigsaw puzzle. 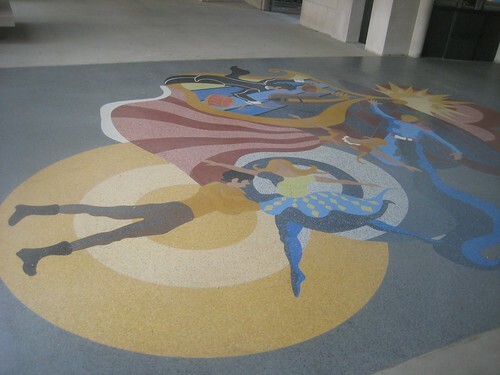 In the traditional terrazzo installation process, which is still widely used for large installations, each section of the work is laid out with metal divider strips, and each terrazzo color is individually troweled into place. 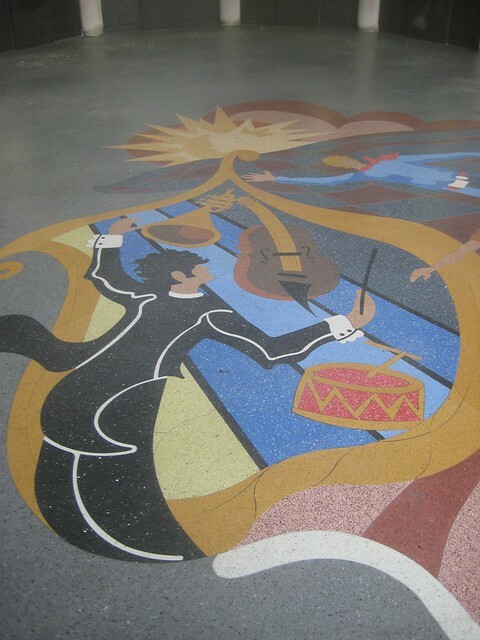 As with many "re-creations" or "replications" that are performed today, the new terrazzo installation at the Muny is a somewhat watered down version of the original. Looking at photos of the original, you can see that many of the details were simplified. Comparing the maroon / pink striped dress and white fringe with the original below you can see that the distinctive scalloping of the fringe and stylized detail of the dress stripes was lost. Many of the color variations of the original also are missing from the new installation. The ironic thing about the loss of detail is that the technology available today allows details to be more complex. With water jet cutters guided by computer generation, accurate re-creation of detail should not be an issue. While it is not an exact replica of the original artwork, I am still very glad that the Schnucks stepped forward and offered to fund this installation so that future generations will be able to enjoy it. 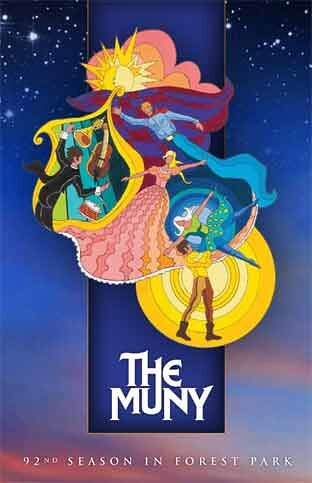 A program cover shows the original design of the artwork by Nancy Day. CORTEX's demolition at Forest Park Boulevard & Vandeventer is well underway this week with the front half of the one story section down as well as much of the two story building at the northwest corner of the complex. With most of the portion fronting Forest Park gone, you can start to get a sense of the scale of the building and the vast amount of emptiness to come, well over an acre. Only the parapet wall and the decorative iron scrollwork that graced the corner are missing from the more prominent three story building. When this comes down, the vista viewed from the west will open up to the gas station/carwash across Vandeventer and SLU's surface parking lot to the north. 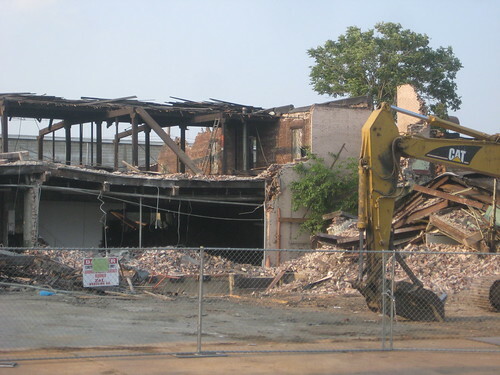 CORTEX to Demolish Building at Vandeventer & Forest Park Blvd. Several weeks ago a chain link fence went up around the prominent three story building at Vandeventer and Forest Park Blvd. and bulldozers showed up on the small parking lot at the west end of the building complex. A friend quickly confirmed that a demolition permit had been applied for on St. Patrick's day by Z & L Wrecking. The expansive brown brick building complex was constructed in 1901 as the Welle-Boettler branch of the American Bakery Company. 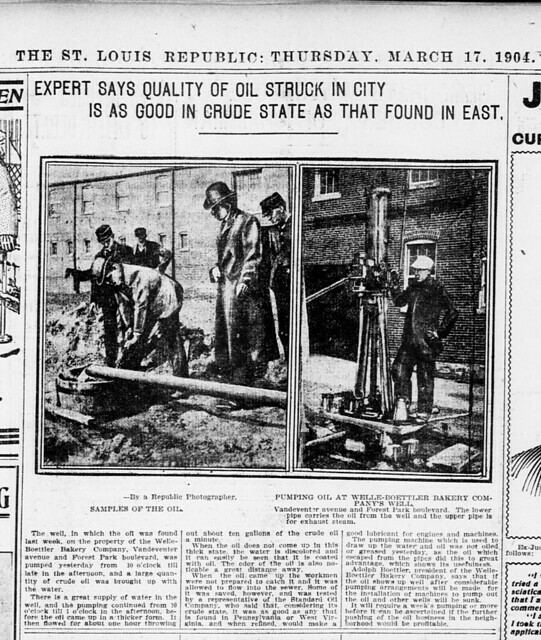 In 1904 according to an article from the St. Louis Republic, oil was discovered on the bakery property. 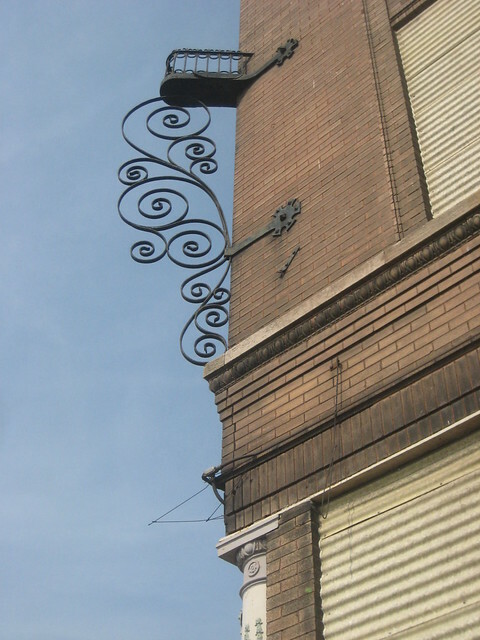 In more recent times, the building was home to Missouri Metal Trims inc. and a storage company. 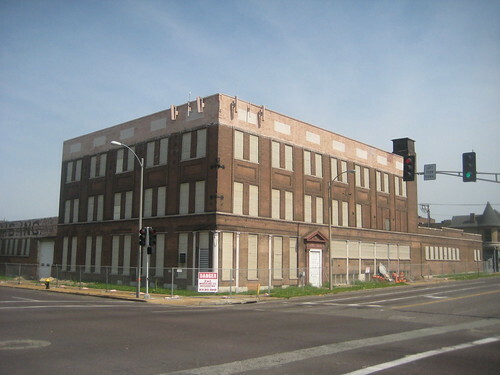 In 2004 the building was purchased by St. Louis University, who then sold it to CORTEX in 2007 for $2,374,146.00. CORTEX is apparently demolishing the building because they do not want to make needed repairs to the masonry shell of the building. 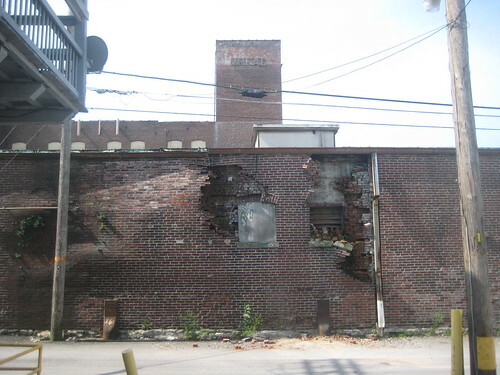 The building has masonry problems as a result of non-existent maintenance by CORTEX, SLU, and likely former owners, including such a basic concept of keeping a functioning gutter on the rear wall of the building. Because of the gutter issues, the outer layer of brick is falling off the building or bucking outward in several locations along the alley. Beyond the alley wall there are a few locations of visible bowing of the masonry walls, including a small area at the parapet of the one-story section facing Vandeventer that needs attention, one minor location at the three story section that is not an imminent threat, and at the one story section facing Forest Park Blvd next to an area that has seen previous repair. 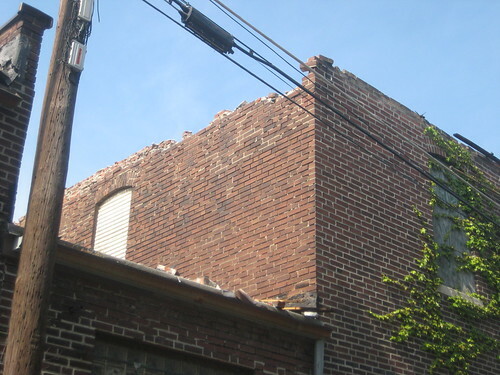 The cost of this demolition is not cheap, and neither are masonry repairs, but unless the masonry issues are causing serious structural failures, which these do not appear to be doing, they are not something that should warrant demolition. The estimated cost listed on the demolition permit application is $179,000! This amount of money could likely buy repairs and re-building sections of the back walls, a new gutter, as well as stabilizing and repairing some of the bowed areas on the street facades. Crumbling parapets top walls missing mortar and covered with ivy on the alley side. 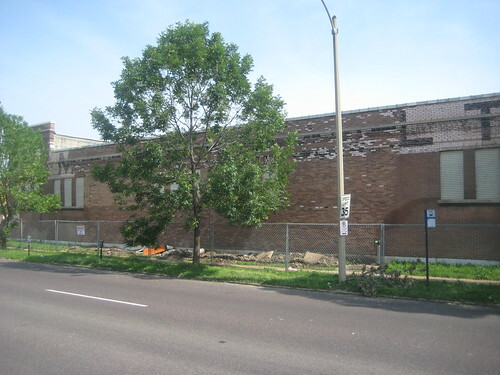 Back in 1998, a former owner of the building prior to SLU's purchase cared enough to completely re-build a good portion of the front wall of the one story portion of the building facing Forest Park Blvd. This portion of the front wall had collapsed after it had bowed out over a period of years. I recall being impressed that they re-built the wall with all details and windows in the original locations. The re-built section of wall above is between the painted "M" and "L". As I mentioned in a recent post, CORTEX has had a hit and miss record developing what was supposed to be a burgeoning bio-tech district linking SLU and and the Washington University Medical Center. 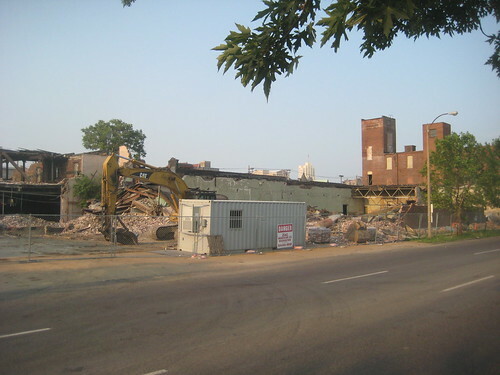 With no publicly announced plan for redevelopment of the site, after the existing building is demolished, the property could remain a gaping vacant lot for years to come, unless CORTEX sells to someone else. 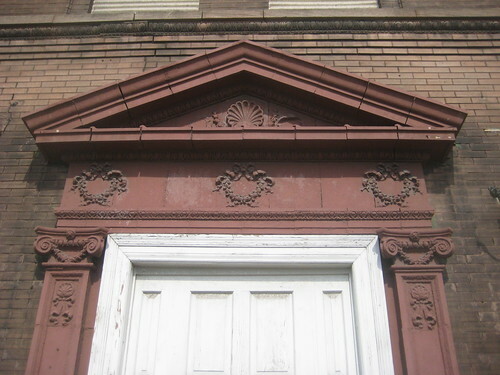 A decorative terra cotta pediment over the Vandeventer entrance. While CORTEX may not be in a position currently to build another large new building to house growing biotech companies or have a large company re-locating here to sell to, however on the other end of the same block is the Center for Emerging Technologies (CET), a business incubator for start-up biotech companies. The CET started in a small existing building near Forest Park Blvd. and Sarah, then expanded in 2002 with a historic renovation the former Dorris Motor Car Company building next door. The CET incubator has graduated several successful start-ups, some of whom are tenants in the CORTEX building at Forest Park and Boyle. The former Dorris Motor Car Company building renovated for CET in 2002. One thing that the CET lacks however is wet lab space. For the last several years the CET has been trying to raise money to build a new 60,000 s.f. lab building on a vacant lot on Laclede between Sarah and Vandeventer. A 2009 article from Park Central Development's online newsletter mentions that the CET had received a $1 million dollar donation from Monsanto toward construction of the $28 million building, but that they needed $2-6 million more to begin construction. 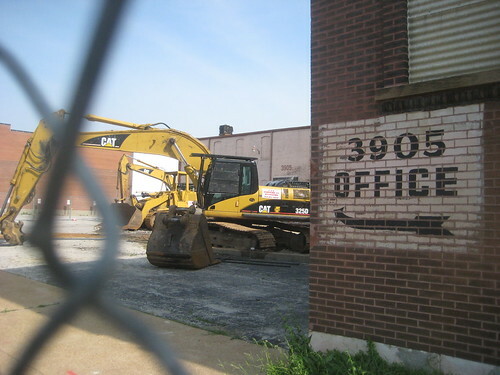 Two years later, the proposed construction site on Laclede sits vacant while the need for wet lab space lingers. Bulldozers sit on the parking lot west of the building. Some have the opinion that the nature of the wet lab space desired by CET requires new construction. A quick Google search however reveals that wet labs have been successfully in existing and historic buildings across the country. 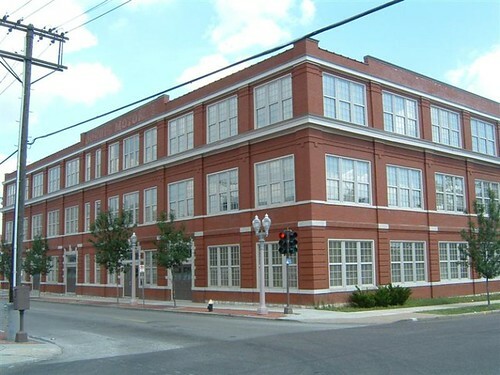 The SCRA MUSC Innovation Center in Charleston was built in an existing single story 28,400 s.t. warehouse building and contains 11 wet labs, offices and shared amenity spaces. The Triangle Biotechnology Center in Durham, NC is located in a former auto service garage that is on the National Register of Historic Places. In Charlotteville, VA, a Coca-Cola bottling plant built in 1939 is being redeveloped as the CityCampus Biotechnology Center, which will include wet lab space for start-up and early stage life sciences companies. 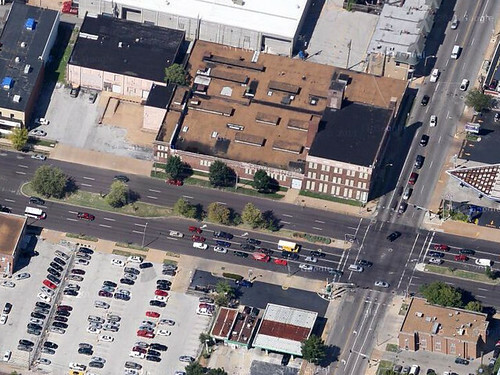 The ground floor of the building at Forest Park and Vandeventer has about an acre of floor space (43,560 s.f.) with high ceilings that would be ideal for conversion to lab space. The upper floors of the three story section contain another 15,000 s.f. of space which could house offices or other support spaces. While not currently on the National Register, the building is very likely eligible considering that several buildings of lesser architectural significance in the nearby area have been successfully been renovated with the use of Missouri and Federal Historic Rehabilitation Tax Credits. Brownfield Tax Credits might also be available to offset costs associated with environmental cleanup. With these incentives, much needed lab space could be much more feasibly obtained through renovation than through the high cost of new construction. By demolishing this building, CORTEX is blowing a great opportunity to add to it's fledgling biotech district rather than subtract from it.